This year the nominated course was Tarraleah, which, given that its surrounded by Hydro generation schemes, should have been an unfair advantage for Felix and Ian (extending the Aurora curse to another format!). But was it? Was it indeed…. The weather was fine, a bit of sunshine and no wind to speak of. The greens had been recently sanded, which made for some interesting (despicably difficult) putting. We got old mate out of bed in the clubhouse I think and handed over a Hundy – which may have been the most money he had ever seen. No one else about, so we were good to go with a 5 man group. After kissing the ceremonial Owl – Ian, Felix, Leigh, Leroy and Stu (1st Major) stepped onto the course raring to go at about 10am, unawares of the dirty thieving crows lurking in the woods just waiting to pounce on any golf ball that landed in the middle of the fairway. Felix found the trees, Leigh found the fairway with first and second shots – only to see the crows fly off with a ball both times and with some random chipping – Leroy got the only par. Felix, Leroy and Ian all made par on this one thanks to some good chipping and putting. Stu, Felix and Leigh, launched some massive drives right down the middle, with Ian not too far behind and Leroy well back – with only a few metres separating them – Felix took the prize, we all made bogeys (Ian going for the double variety). We all had good drives down the middle to the corner of the dogleg left – with Stu the only one making par, where the rough around the green made for some tricky chipping, bogeys for the rest (Ian and Leigh opting for the double variety). Stu made the green in reg and made par, the rest of us going for bogeys. Leigh found the roughest rough left and had to tee off again, Felix stormed in to make the only par on the hole. This one had a giant gum tree in the middle of the fairway for target practice, alas nobody hit it. Leigh, Stu and Leroy all made par and bogeys for the rest. We stepped up feeling good about going the pin, but sprayed em everywhere. After 4 tee shots, the spot prize became nearest the green. Leigh teed off last and showed us how its done landing on the green to scoop the prize and make the only par on the hole. 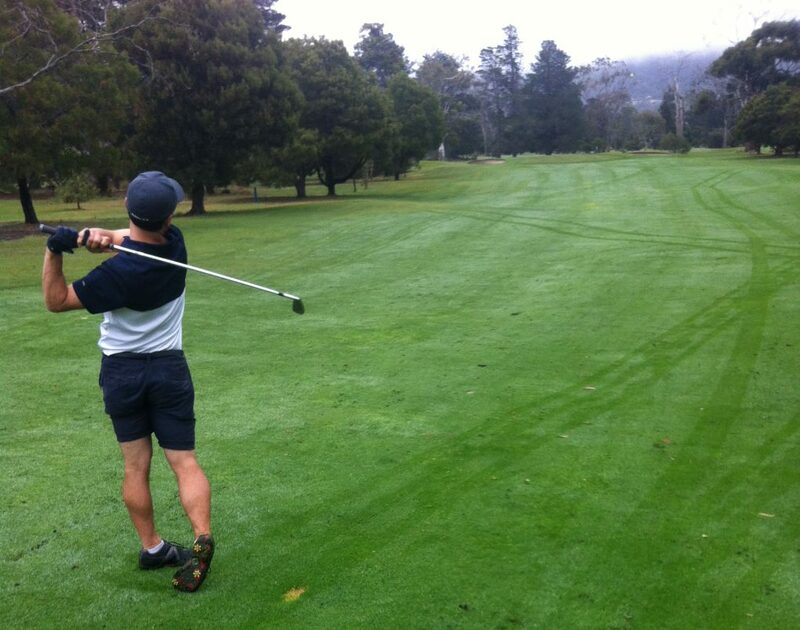 Stu and Leroy made pars – Stu hit the green in reg and 2 putt and Leroy chipped on from 30m and made a 1 putt. Others made bogeys (Ian the double variety). Felix and Stu (drained a monster putt) mounted a charge with birdies from great golfing shots, Ian made par and bogeys for the rest – with Leroy sinking a longish putt to save bogey. This was Ian’s hole, he hit left into the trees, chipped through the trees to be 15m from the green and then chipped it in for par – awesome stuff, high 5’s all round. Felix made par, Leroy saved a bogey with another long putt, Leigh and Stu made doubles. This was Stu’s hole with a monster drive, then onto the green in 2 and then drained the monster putt for eagle and 4 points to storm up the leader board. Leroy made par and Ian a double – wipes for the rest. It was turning into a 2 horse race. Pars all round for 4 of us, with Felix making bogey, all pretty steady play. Leigh made the only par, but it was Leroys hole with a wild tee shot into the pine trees left, then an awkward lie didn’t yield much from a chip and then chipped onto the fairway for 3 to be 30m out – then a nice chip and a lucky bounce saw the ball roll in for a bogey – which all others made (Ian the double variety). Felix, Leigh and Ian made par – with Felix doing it from the other fairway. Stu grabbed a bogey to close on leroys lead to 1 point – where Leroy went for the double variety. Leigh made par, Stu hit a great drive down the middle, Leroy went trees left and scrambled a bogey, Stu, Felix (the double variety) and Ian also made bogey. Leroy hit a good one to just near the green, Stu found the trees right and in real trouble – a few chips later he took a wipe. Leroy chipped on and then drained a monster putt for par to take a 4 shot lead. Felix and Leigh grabbed a bogey and Ian a double. Everyone pretty much playing for 2nd place now. Felix found the trees left and lost a ball, then hit a provisional and lost that too. The others played steady for bogeys – none of the double variety. Throughout the day there was much sledging and laughter trying to put the leader off, which made for a fun day. Especially if you were Leroy, who got his giggle muscle constantly massaged and got to sup from the Auld Mug by winning his first ever Bash’n’Dash. Posted on July 29, 2016 February 15, 2017 by Gentlepersons' World Golf Tour, Tasmania	This entry was posted in golf and tagged chip-in, crows, golf, majors, oldmate, owl, tarraleah, tasmania. Bookmark the permalink.